Double Hollyhocks | Gurney's Seed & Nursery Co.
Foliage5 - 7 sided, large rounded, dull green leaves. Flower FormDense, double flowers borne singly on tall stalks. ColorMixture (Pink to dark red, yellow, and cream) Our choice of colors. BloomsMid-Summer for 4 - 6 weeks. Blooms with: Four O'clocks, Dianthus, Coreopsis. Soil RequirementsNeeds constant soil moisture. Too wet or too dry causes weak plants. Fertile soil, with occasional applications of fertilizer. PruningDeadheading wilted flowers will encourage reblooming. Trim back spent flower stalks in late Fall or early Spring before new growth starts. CommentsTall, sturdy Double Hollyhocks are prized for their kingly height and their showy, ruffled, carnation-like blooms. 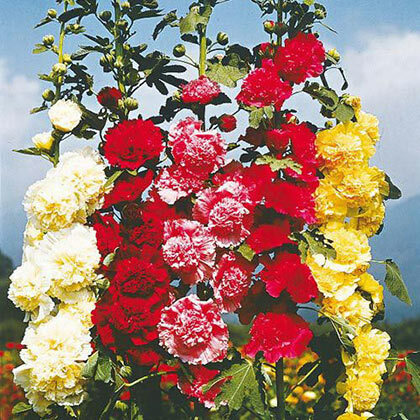 Ideal against a building, fence or wall, these old-fashioned favorites produce an explosion of colorful flowers. Excellent for cut-flower bouquets, too! Stately old fashioned plants in a charming mix of colors. Double 'powder puff' flowers are striking in size and texture. Great for mass planting, specimen planting, or at the back of the border. DepthPlace root system just under soil surface.